Hypancistrus zebra, or Zebra pleco, is just one of the 34 species of which we sequenced the liver transcriptome, but a good example of all the current threatens against Loricariidae fish. The Zebra pleco is endemic to a stretch of Xingu River of only 100km. This region, known as the “big bend”, is impacted by the construction of the Belo Monte dam, the world's third-largest hydroelectric dam. Fish ecologists say that the habitat changes caused by the dam construction puts this species at risk of extinction. This is among the main reasons why the Zebra pleco is at the list of endangered species from the Brazilian Ministry of the Environment and its capture is forbidden. Another major cause of concern is the Zebra pleco being extremely valuable in the international aquarium trade and, therefore, the traffic of this species is a regular practice that has challenged the Brazilian Environmental Authorities and the Federal Police. Sequencing and annotating the transcriptome of H. zebra and other endemic loricariids are effective ways to catalog and preserve the genetic biodiversity of these species. 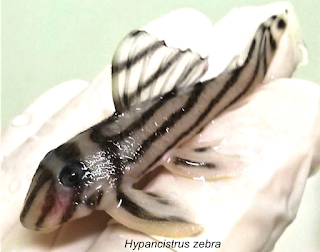 This genetic information provide environmental police-makers and the Federal Police unique ways to prevent and combat the traffic of the Zebra pleco and several other Loricariidae fishes popular in in the aquarium trade. Moreover, the genetic information that will be produced can also be useful to subsidize strategies for the conservation of these species, including their reproduction in captivity. By the way, the Zebra pleco we used were a kind donation from Dr. Jansen Zuanon, a fish taxonomy and ecology at the Brazilian National Institute for Amazonian Research who serve as the trustee for all H. zebra apprehended by Brazilian authorities.